Think carpet isn't the best choice for homes with pets? Think again. Indianapolis carpet store Kermans loves pets and knows that carpet isn't just warm and comfortable underfoot for you, it's warm and comfortable for your pets too. (And who spends more time on the floor anyway?) Carpet also gives your home a non-slip surface that can be safer for animals whose footpads tend to slide easily on tile and hardwood. Worried about noise with barking dogs? Carpet's natural sound-absorbing qualities are another nice bonus. Carpet is indeed a great choice for pets. Just make sure you consider the type and style of carpet carefully. 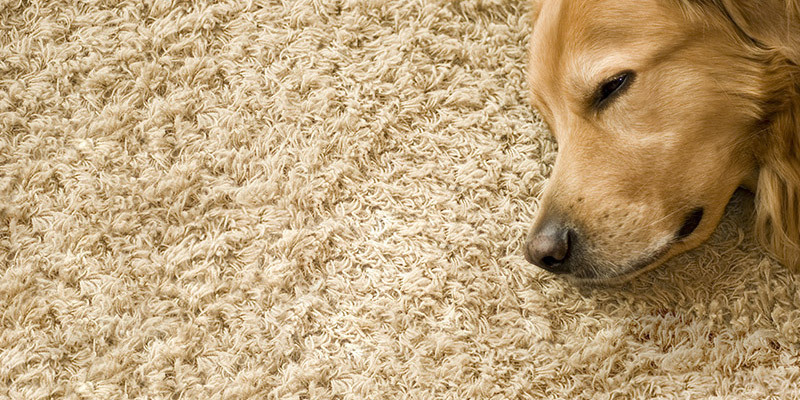 Here are three things to keep in mind when you shop for carpet in a pet-friendly home. There's no doubt about it: if you have pets, you will have messes on your floors. Dirt and mud brought in from outside. Accidents when Fido is left home alone too long. Spills when an over-exuberant tail wag bumps into a glass on the coffee table. Pets and messes tend to go paw in paw. Look for carpet with the highest stain resistance you can find. You'll still need to tackle the mess as soon as possible, but your carpet will be more forgiving of stains if you have one that is pre-treated. Many carpet manufacturers now offer a special stain resistance made with pets in mind. These carpets are also often designed to prevent pet stains from soaking into the fibers and through to your carpet padding - where smells, bacteria and mold can cause long-term issues from pet messes. Stay away from carpets made from wool. While wool makes soft, wonderful carpet fibers, but they aren't very stain resistant. Ask for carpets made from nylon fibers. Nylon-based carpets are more durable, more stain resistant and more affordable - a great choice for busy households. You should be vacuuming your carpet weekly to keep it looking its best. Help yourself out between vacuuming sessions by getting a color and style of carpet that hides some of the pet hair. Patterned carpet can be a great choice for pet lovers and there are many beautiful patterned carpet choices on the market. If you have a long-haired pet, mention that to your carpet associate - some styles of carpet release the carpet hair better making clean-up not such a chore.